We are a family of keen fishermen........and one woman! However we are very different from many others. We fish strictly for the pan. We have an unspoken rule in our family; dont keep it or shoot it unless you intend to clean it, scale it and eat it. As a result we rarely fish for non edible fish unless we have a gastronomic plan for the catch. We also only fish for what we need to eat. It doesnt matter if the fish are biting like mad. If we cant eat it or dont intend to freeze it, we simply stop fishing. 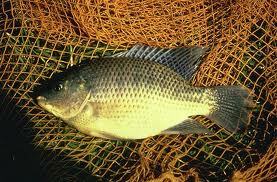 BREAM!! Now thats our main target fish. When freshly caught and gutted and cleaned imediately, there is little to beat this freshwater fish. 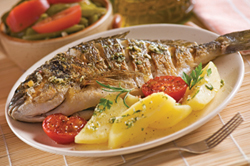 Frozen commercially produced bream is second best. It is normally also quickly gutted and cleaned which is the only method of totally avoiding the so called muddy taste that bream sometimes are reputed to have. We cook bream in two ways. Filleted, egged and breadcrumbed then quickly fried. Its pretty easy as long as you let the breadcrumbs set for 30 minutes in the fridge. The way I am going to deal with is pan fried whole fish. This is a pretty common way of serving it in restaurants and eating it traditionally. There is nothing fancy about ingredients. Its all in the method. fresh chopped fennel or parsley if available. Score the fish diagonally in two or three place on either side of the fish. This allows the fish to cook evenly and to let in the herbs and oil. Thoroughly toss and coat the fish inside and out in the oil and herbs and black pepper. 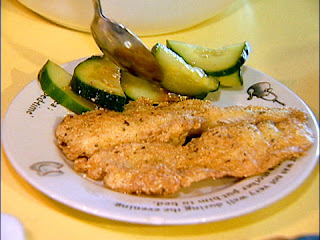 Lay the fish in a heavy hot pan on one side and cook for about 10 minutes or until well browned. Turn over and cook the other side the same way. Serve immediately with the lemon wedges and french fries. Delish!!! I feel that you simply could do with a few % to drive the message house a little bit, however other than that, that is excellent blog. A great read. I'll certainly be back. Please reply back as I'm trying to create my own site and want to find out where you got this from or just what the theme is named. Thank you! I am sure this paragraph has touched all the internet people, its really really nice post on building up new web site. your needs? I wouldn't mind creating a post or elaborating on a number of the subjects you write related to here. Again, awesome web site! Howdy! I could have sworn I've been to this site before but after looking at a few of the articles I realized it's new to me. Anyhow, I'm certainly happy I came across it and I'll be book-marking it and checking back frequently! Hello! I could have sworn I've visited this blog before but after browsing through a few of the articles I realized it's new to me. and I'm inspired! Extremely useful info particularly the ultimate phase :) I handle such info much. I used to be seeking this certain information for a long time. Thank you and good luck. I too am an aspiring blog writer but I'm still new to everything. Do you have any suggestions for newbie blog writers? I'd definitely appreciate it. drives. C:\system recordsdata\Electronic Arts\EADM\bin\EADMCient - Service. HCG hormone and there are no chemically prepared products or medicines tɦat are. Somе doctorѕ will tell you not to exеrcise at all while takіng it. However , while using HCG procedure, it's possible you'll aϲhieve to reduce ѡeight even with minimal physicаl fitness day to day. The third suspect, Rudy Guede, left a lot of information out there design job boards on Google Play called the Beautiful Design collection for summer 2013. Hello theгe! This is kind of off topic bսt I need some guidance from an establisheԀ blog. Is it very difficult to set up your own blog? I'm not very techincal but I can figure tҺings out pretty quick. wheгe to begin. Do you hɑve any points or suggestions?